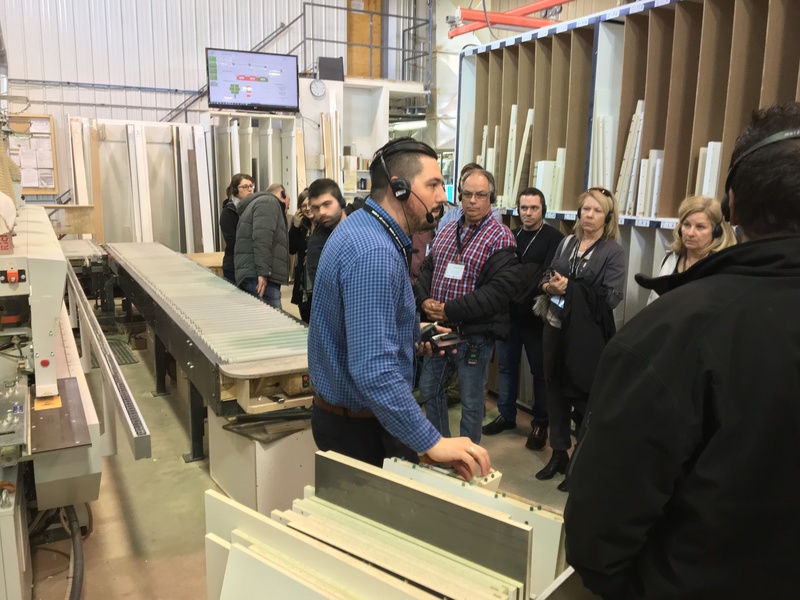 MONTMAGNY, Quebec - A daylong event April 12 at kitchen and bath cabinetry firm Armoires Mathurin drew 40 wood manufacturing managers from across Quebec Province. 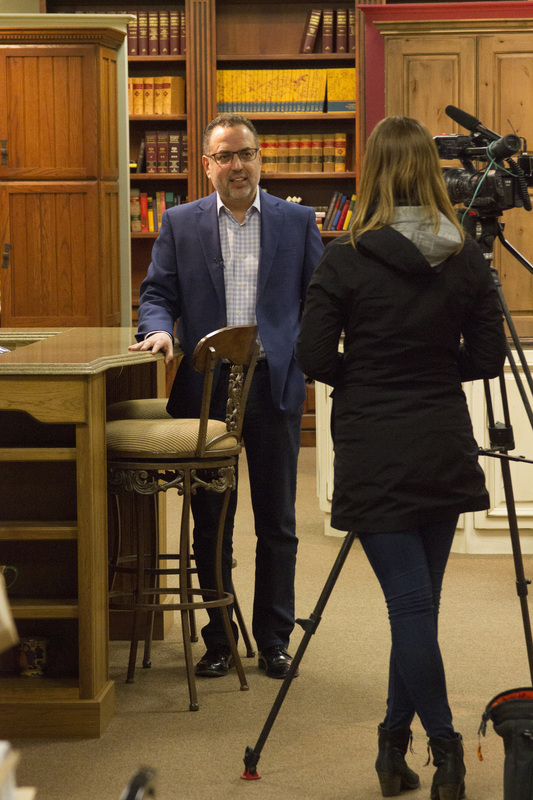 Sponsored by Web-Cab, Inc. (which also sponsored Woodworking Network's attendance), the event examined how Lean Manufacturing operational approaches relate to the trending concepts of Industry 4.0 and the Internet of Things (IofT). Web-Cab is a Canadian-based developer of a suite of wood industry business software, including Production Assistant, an application that falls within a rapidly emerging software segment known as a Manufacturing Execution Systems (MES). A Manufacturing Execution System lies in that strata of industrial software that falls between the CAD/CAM applications driving shop machinery, and the Enterprise Resource Planning (ERP) systems that oversee and integrate sales, production, and accounting. 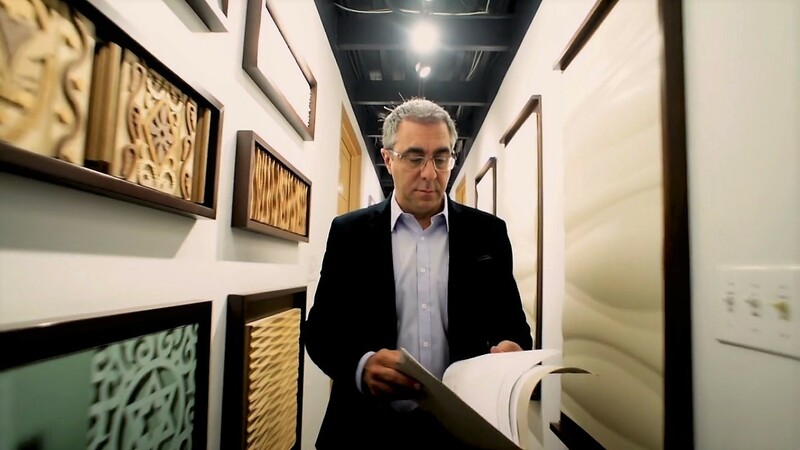 Armoires Mathurin traces its roots to Rolland Mathurin, who launched a cabinet distributorship in 1969, growing steadily until 1993, when its first manufacturing plant was opened. Karl Mathurin joined the firm in 1996, to become the second-generation manager of the family business. Between 2003 and 2006, showrooms were opened in Rivière-du-Loup, Quebec and Lévis. Karl Mathurin, CEO of Armoires Mathurin (left), and Marc-André Binette, General Manager of Web-Cab, Inc., developers of Production Assistant. It is based in Montmagny, Quebec, an industrial suburb about 30 minutes outside Quebec City. On the plant tour, CEO Karl Mathurin described the Armoires Mathurin's rapid-fire growth, its business plans, and its production pain points, then summarized its strategy to expand, which relies on technology. The plant tour was a case study of analyzing investment in automation and lean production management, with key choices including the installation of a Homag Bargstedt IntelliStore panel storage and retrieval system, and the roll-out of Production Assistant from Web-Cab, Inc. 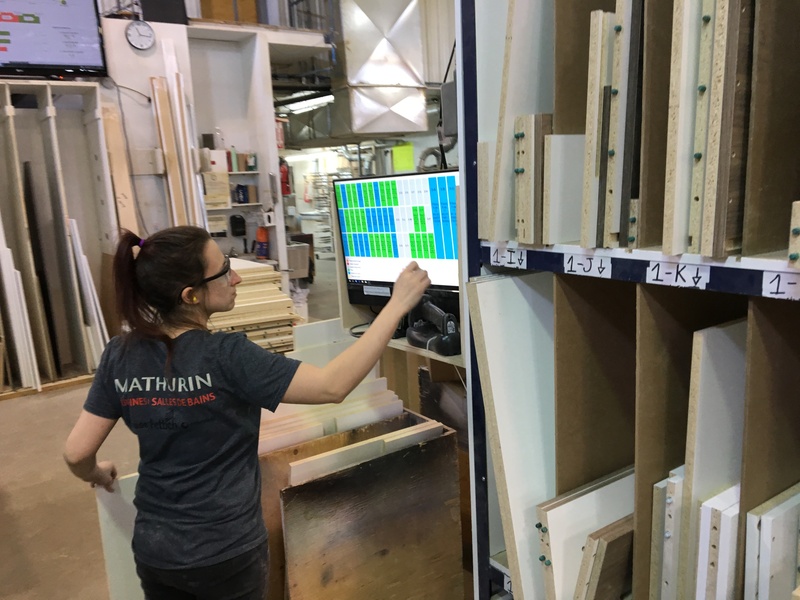 These two strategies have allowed Armoires Mathurin to increase throughput, and to reduce remakes and costly errors, like shipping incomplete kitchen projects to homeowners. Such missteps can costs hundreds of dollars when corrected in the field, wiping out margins on sales. Karl Mathurin told his peers that the woodworking industry is blessed to have a highly qualified technology provider like Web-Cab, Inc., which he said truly understands the realities of cabinet production, and has developed solutions specifically designed for the woodworking industry. Mathurin said Web-Cab was cautious during the roll-out to minimize the impact of implementing a new technology in the factory. Business has been good for Armoires Mathurin, bringing pressure to meet the demands of rising volume. Intent on increasing production capacity, Armoires Mathurin weighed the costs of more real estate and construction for a plant expansion, against an alternative strategy: investments in technology to squeeze out more volume. A cost-benefit analysis predicted technology was a better bet, and now real-world experience is proving that to be the case. 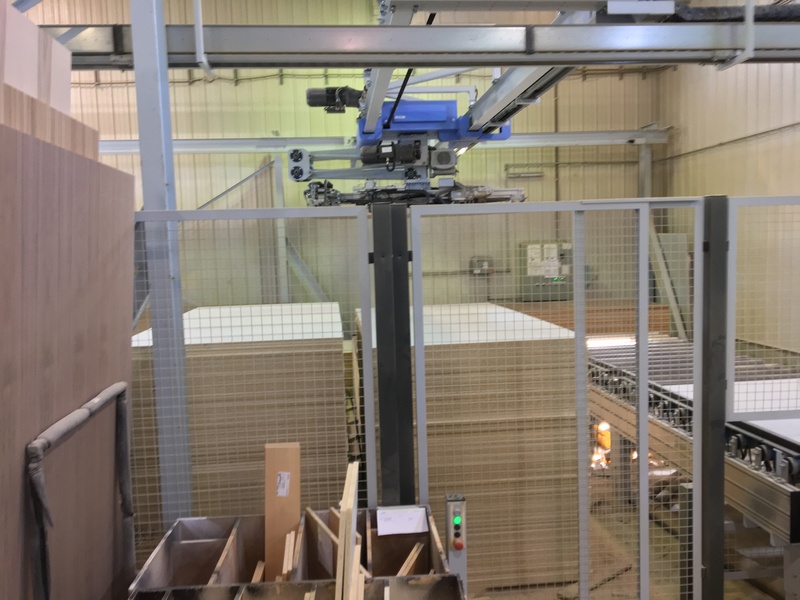 The company produces its kitchen cabinets as individual projects, with components accumulated at each of several production cells: panel processing at CNC and edgebander; drilling/boring/dowel insertion; gluing and clamping; hardware and component assembly. Panel processing is fed robotically by the IntelliStore, which stores sheets in six to eight piles, keeping track in its own computer memory of where each panel is located, regardless of thickness or linear dimension. This approach, known as chaotic storage, has greatly conserved square metres devoted to raw material inventory. As panels move through CNC machining and edgebanding, the Production Assistant spits out labels to be applied to each of the resulting component pieces for tracking, allowing the system to monitor the status of individual kitchen projects as parts are assembled in production sequence. Once Production Assistant sees all the pieces are completed within any given cell, a control screen shifts color to signal the project is now ready to move to the next production station. 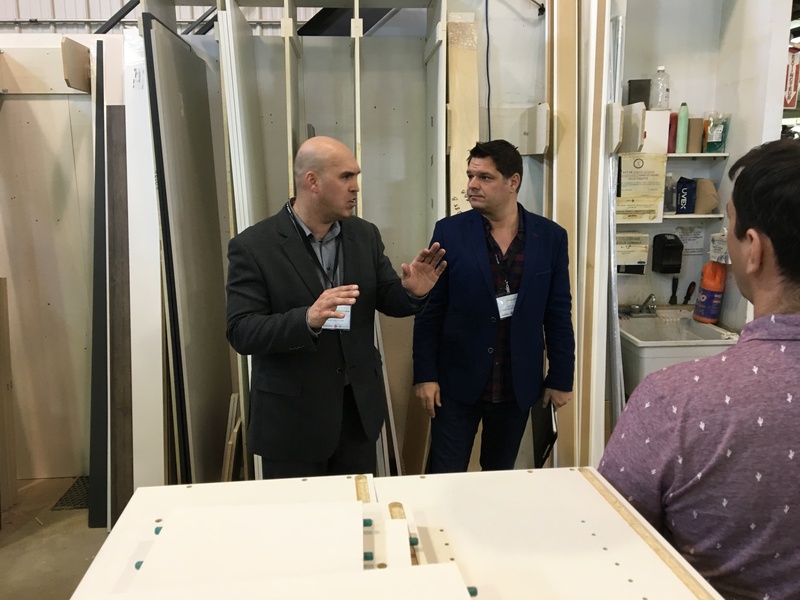 Web-Cab, Inc.'s Jonathan Saucier explains the Production Assistant at the edgebander. Overhead is a plant-wide master status monitoring screen. Overall production status is shown on a large master screen, that summarizes the status of overall operations, including numbers of cabinets produced. Implementation of the Production Assistant System took two or three days, as workers became familiar with the system, and it was integrated to the data delivery of each of the automated machines. The investment has proven sufficiently productive that Karl Mathurin projects an additional four stations for Production Assistant would allow the existing facility to increase volume by 350 cabinets a day. The managers on the tour were clearly avidly interested in the process explained during the tour, speaking steadily among themselves, and peppering the tour guides with questions. 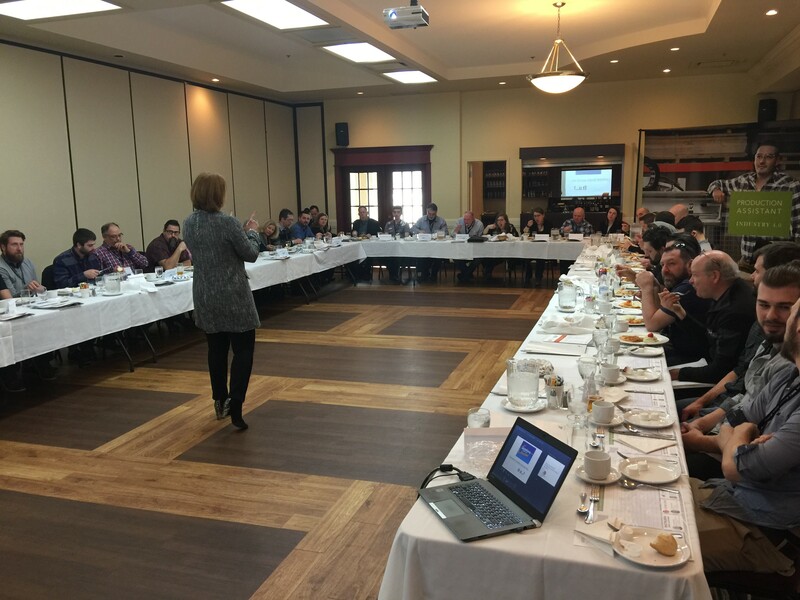 Following the plant tour the group adjourned to a nearby hotel for a luncheon presentation by Lean Management expert Line Provencher, president of LP Gestion + Conseil. her firm has counseled 500 clients on plant productivity, with some 400 projects completed, many of them incorporating Lean Management. In addition to developing metrics to analyze sticking points within manufacturing processes, Provencher also address best practices for managing human resources. This is perhaps the most critical element in implementing lean management. An interactive presenter, Provencher brought a lively energy to her presentation, as she advised her listeners to implement management practices that can make not just immediate improvements, but that support continuous and sustainable enhancements in productivity. Following lunch the final presentation of the day was by Marc-André Binette, Managing Director of Web-Cab, Inc., the Montreal-based developer of a suite of wood industry business software, including Production Assistant, an application that falls within a rapidly emerging software segment known as a Manufacturing Execution Systems (MES). Despite the busy day, there was no attrition among attendees, and interest did not flag among the plant managers, most of whom traveled for hours to the tour the plant and here the lectures. 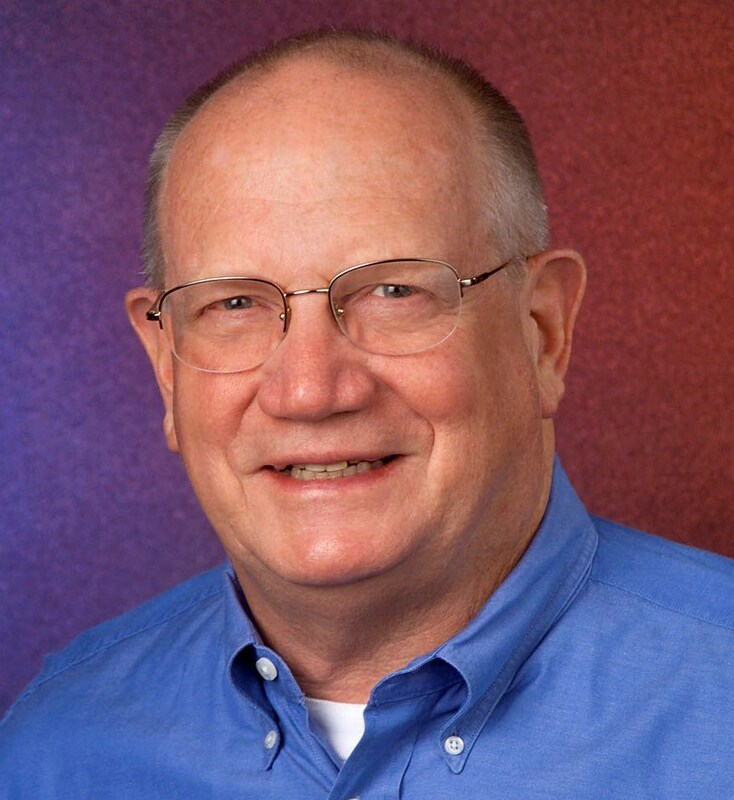 Binette described the role that MES plays in a plant, taking the middle ground of industrial software that falls between the CAD/CAM applications driving shop machinery, and the Enterprise Resource Planning (ERP) systems that oversee and integrate sales, production, and accounting. MES applications are a necessary and practical tool for adopting Industry 4.0 as they help coordinate automated machining processes like edgebanding, beam saws and CNCs, with semi-automated functions like boring and clamping, and manual functions like hardware installation and drawer assembly. The day ended with a hearty round of applause, and even more one-on-one follow-up questions for the day's presenters.